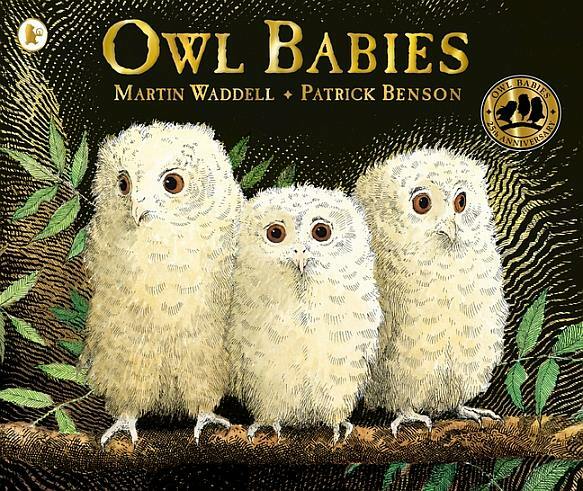 First published in 1995, Martin Waddell and Patrick Benson’s gorgeous tale of three baby owls has become a classic. A quarter of a century on, and over four and a half million copies later, Owl Babies 25th anniversary edition continues to engage young readers around the world. A story of three baby owls, Sarah, Percy and Bill, who wake one night to find that their mother is gone. They sit and wonder, wide eyed, in anticipation for her return. At last she does return and the owl babies welcome her home with joy. Patrick Benson detailed illustrations are stunning, particularly the powerful double spread when mother returns- “And she came.” Benson captures the dark sky perfectly without making it too scary for little ones. Martin Waddell’s text is simple, yet faultless. Not only showing the love and attachment between children and their mothers, Waddell also encapsulates the fear, the vulnerability and the relief that any child has ever felt when they have been lost or separated from a parent, but does so with an element of humour. It is no wonder Owl Babies is still thriving 25 years on. Owl Babies is a timeless tale and is sure to be treasured for many more years to come.